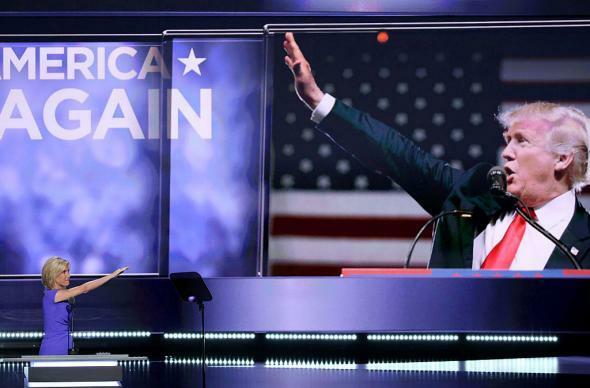 Did Laura Ingraham Intentionally Give a Nazi Salute Last Night? An Investigation. Laura Ingraham at the Republican National Convention in Cleveland on Wednesday night. 2. Ingraham is a Nazi and, while she doesn’t want people to know it, force of habit got the best of her in all the excitement. Odds: Also zero! Moving on. 3. Ingraham isn’t a Nazi but she wanted to fire up white supremacists in the arena and across the country. Odds: Almost zero. Yes, it’s easy to find racists among Trump’s fans, but its safe to say the vast majority of them don’t actually self-identify as white supremacists, let alone the kind that go around greeting each other with, “Heil Hitler!” Ingraham would be risking way too much for way too little, particularly since the white-supremacist vote appears to be one Trump already has locked up. 4. Ingraham was trolling liberals and the media. Odds: Fair. If you watch the clip again, it certainly looks like she knows what she is doing. She turns to her left and immediately extends her right arm out at a slight upward angle with her elbow locked. She doesn’t pause, exactly, but she does hold the gesture ever so slightly. It looks just ambiguous enough where she would have been able to predict the social media frenzy that followed last night while still giving herself plausible deniability (and a tailor-made media-bashing anecdote) today. 5. It was an accident, a totally random outstretching of her arm without any meaning or motivation. Odds: High. Ingraham follows the act in question by waving and then pointing to the crowd. She may have simply intended to finish her speech with those two actions—a wave, followed by a point—but in her excitement (or, perhaps, as a result of over-rehearsing the movement ahead of time) she combined the two, resulting in the open-handed, palm-down point. Given the general white ethno-nationalism vibe that has been on display at the GOP convention the past few days, and at Trump rallies the past year, many of us watching at home then saw something more scandalous. Am I willing to rule out no. 4? No. But after a closer look at the game tape, I’m more inclined to believe that this was nothing more than an accidental hand gesture that just so happened to mirror one of the more infamous hand gestures in history.